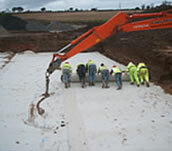 CubicM3 has a full range of geotextiles and geogrids to meet your civil construction needs. To ascertain your correct requirement, contact our technical team who will be able to assist in providing the product to meet your requirements. ​Next day delivery for orders guaranteed. GET IN TOUCH WITH OUR geotextiles SALES TEAM NOW!